My newest secret hobby (when no one is looking at me, obviously) is looking at food. Yep. I said it. I find it strangely reassuring. Grounding. To carry a pear in your handbag is to carry a piece of the earth with you. Something that grew from a tree, out there, somewhere. No matter how industrialized the plantation it came from. Pears still grown on trees. There must have been lush grass that was sometimes covered in morning dew. 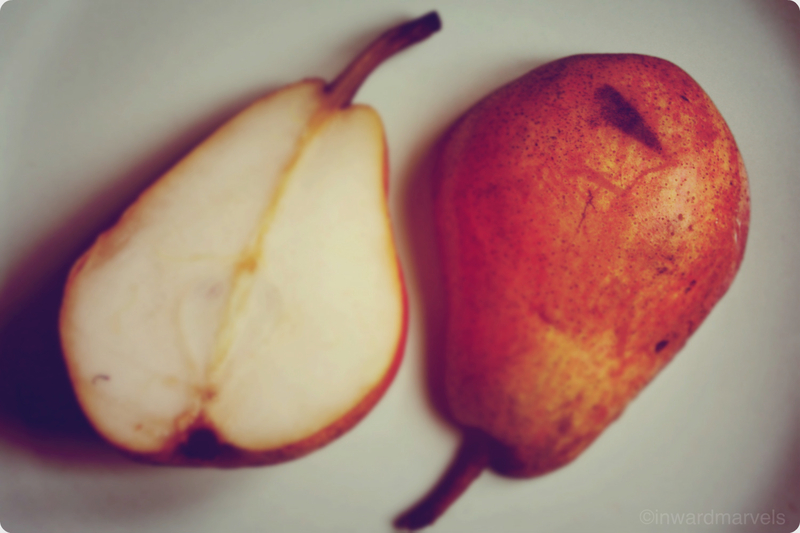 Sometimes the sun burnt rain droplets off the pear’s dangling heaviness. Sometimes the silent night lulled it, and above it shone the stars, silently. It was probably in some vagabonding cat’s territory, too. And maybe there were crickets. To take it out of the bag in your office when you have a moment to yourself. Take the time to feel its weight in your hand. We never take the time to feel the weight of anything anymore. Feel its coolness. Its firmness. Really feel it. Like it was something important. The roughness or glossy smoothness of its skin. Feel the tiny little freckles. And then look at the freckles. Their irregular pattern. Notice its wooden stem that still tells you stories of how it was once born by a tree. 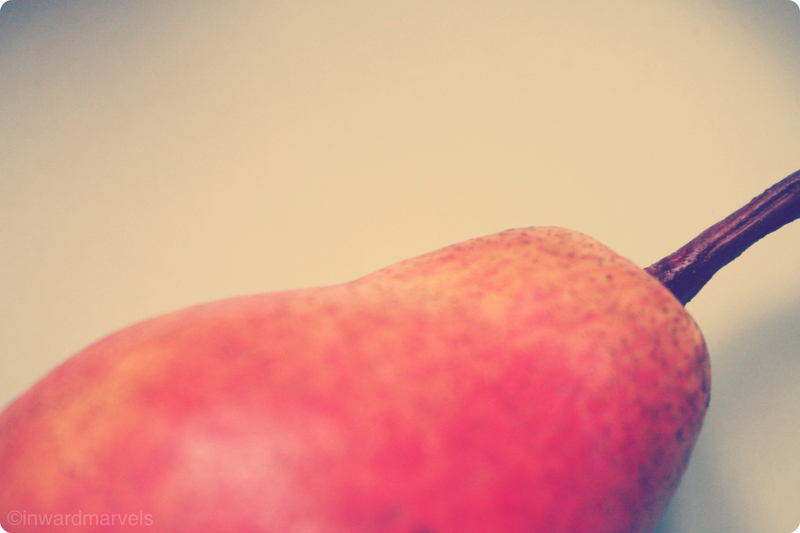 Pay attention to the pear as if it were a movie. Notice its shades; its colors. Its browned dents and lines from the things that pressed against it. Remember the places the fruit visited with you today and how they felt to you. And when you cut it in half, marvel at the inside. The structure, and the slightly bent line running through the flesh, connecting the stem to the remainder of the tree’s blossom. It was probably a nice flower, too. 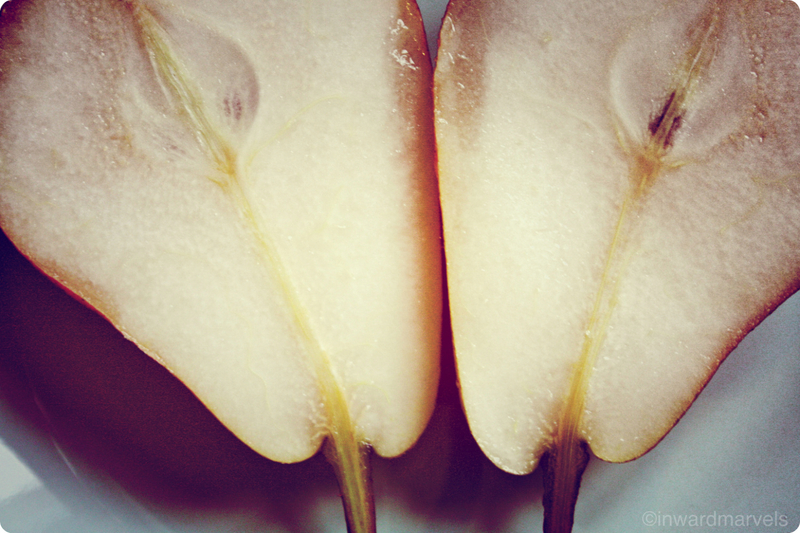 See the pear’s pear-shaped core. Look at the transparent spots. The faint green, the creamy white. The peach-shaded hair-thin line drawn by the skin encasing this little world. I heard about the raisin experiment a long time ago, when I first got introduced to the practice of mindfulness. Yet for the following two years I never actually took the time to see, feel, taste three raisins mindfully. Because that’s weird, right. Also, who has the time? When I made time three weeks ago (an entire 10 minutes, oh my), I learnt A LOT about my three raisins. And it wasn’t even boring. In fact, being the way I am, I almost caught myself developing feelings for them, bonding especially with the cute fat one. It got me wondering how many raisins I have actually shovelled into my mouth without ever even noticing that there is a bottom and a top to a raisin. And at the top, there is a tiny tiny opening, and there your tongue can feel the sweetness of the raisin’s inside just a little bit without even biting and ripping its skin. When you finally do bite the skin, how quickly the intense flavor fills your mouth. Food is beautiful. It is powerful. It has the might to make or break us. The entirety of our bodies’ cells will be replaced by new ones in a mere seven years, they say. Those cells aren’t made from air. The last pic is stunning!